The new 10,800 square-foot casino has 220 slot machines, seven gaming tables, an audio and closed circuit video system. As part of the remodeling and expansion of its facilities, the Costa Bahía Hotel & Convention Center announced Thursday the opening today of its new Blue Dolphin Casino. Hotel owners have invested $5.4 million since the property opened in June 2015 in Guayanilla. The casino’s start of operations, coupled with an increase in the property’s service offering targeted at the family and group meeting markets, will result in the creation of about 75 new jobs in the next four months, property owners said. The new 10,800 square-foot casino has 220 slot machines, seven gaming tables, an audio and closed circuit video system. Blue Dolphin also has a stage where artists will present music and comedy shows. “We’re the first casino that will open just five days a week with the intent of lowering costs and face the trend of casino closings at other properties,” said Blue Dolphin Casino Director of Operations Eric Rodríguez. The operating hours for the casino will be Wednesday to Sunday from 10 a.m. to 2 a.m.
“The strategy of operating full time for just five days a week is unique in Puerto Rico,” said Costa Bahía General Manager Jessica Emmanuelli. The hotel has increased its payroll by 50 employees for the casino opening, for a total of 101 employees. The recruitment of new personnel has been conducted with the support of the Southwest Region Consortium as a result of the company’s commitment to create jobs in the area comprised by the municipalities from Guayanilla to San Germán. Currently, the Costa Bahía Hotel has 136 rooms and will add 33 additional suite-style rooms, Emmanuelli said. “We have completed an extensive remodeling of the convention center; we have added a large water slide and a pool just for kids, as part of the new family attractions that we want to innovate at the hotel,” said Emmanuelli, listing the addition of a new billiards lounge and a 4D-style movie theater with capacity for some 42 people where short movies and documentaries will be shown in the near future. “Our intention has been to create a unique hotel that is family friendly and different to the rest of the tourism offer in this area. We have the biggest convention center in the southwest region, where we want to continue offering services to groups, which constitute our main market, at the same time that diversify to attract the family market,” said hotel owner Eduardo Artau. With 33,000 square feet of space for meetings and events, it has the biggest convention center of the region. The hotel also offers transportation to nearby beaches and tours for groups staying at the property. 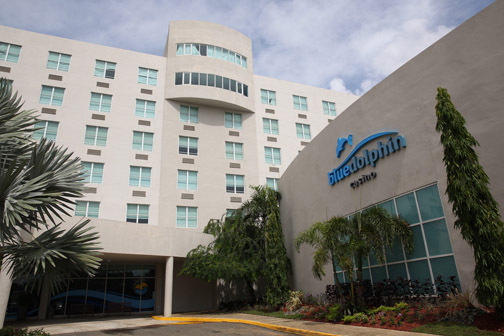 Hey Buddy!, I found this information for you: "Costa Bahía Hotel opens Blue Dolphin Casino". Here is the website link: https://newsismybusiness.com/costa-dolphin-casino/. Thank you.